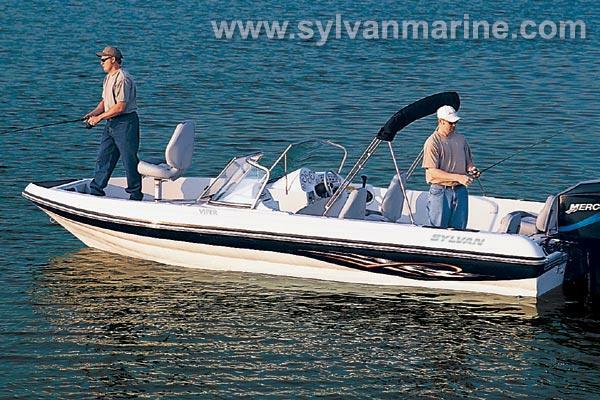 Boat Description With its seven-layer fiberglass construction and ISO NPG marine gelcoat, the Sylvan 180 Viper will take on big, rough water. It features lighted rod storage, a baitwell, two 30-gallon lighted, aerated, recirculating, timed livewells, as well as a big 37-gallon fuel tank. There`s plenty of storage for a day`s worth of gear, three bass seats, a trolling motor panel, motor tilt switch, and two battery compartments. In addition, the V180 Viper sports a curved walk-through windshield, anti-feedback steering, and an AM/FM stereo cassette.